Laura was the third of ten children born to Bill (William Skyler -1888) and Lillie Cressie Wheeler (Elliott – 1896). Siblings included Leonard (1914), Evelyn (1916), Kenneth (1920), Melvin (1922), Clifford (1924), Tonnie (1928), Marcia (1932), Helen (I934) and baby Shirley (1938). 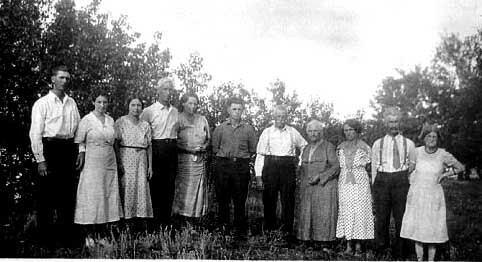 In the early spring of 1924, Bill and Lilly, along with other family members, pulled up stakes and headed out from the Alsask, Saskatchewan, to take up homesteading at Birch Lake, a few miles North-East of Glaslyn. At that time the five children ranged in age from 2 to 10 years and Lilly was expecting her fifth. Clifford was born that September. Lilly attributed the distinctive brown birth mark prominently displayed on Clifford’s forehead to the fright she suffered when Melvin, then two, almost fell from the caboose while crossing a river enroute to Birch Lake. Photo: The wagon train ready to head out. Howard (Laura’s dad’s brother) and Myrtle Wheeler, her mom and dad, Lilly and William, grandparents, and siblings, Kenneth and Evelyn. While Bill and Lillie were able to provide their family with a comfortable life (by the standards of a 1920’s homesteader) it did require the labour of all family members. That first summer, after the crops and garden were planted (some of the land was previously broken), Bill set about building a three room log house with sod roof, mud plastered cracks and whitewashed exterior. Laura had many fond memories of growing up with her brothers and sisters and attending the single room Birch Lake School which was located on the same section of land as their home. As her family lived so close to the school, they inherited the job of building the morning fire to heat the school during the long, cold winters. The school house also served as the Community Church where her Grandma taught Sunday school. Photo: Wheeler children, Shirley, Marcia, Helen, Kenneth, Melvin, Clifford, Laura and Evelyn. Leonard had died in a drowning accident and Tonnie was not present. West of the Wheeler’s, on the next section of land, lived the McNeill family. 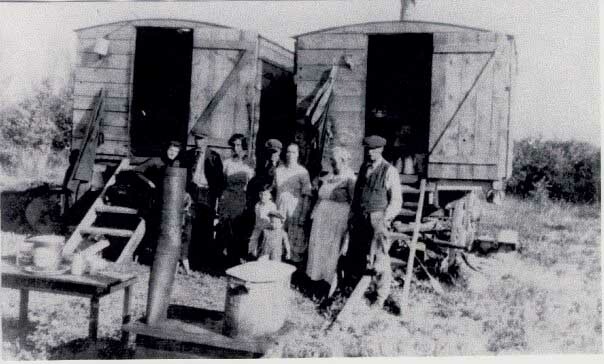 The McNeill’s had taken out homestead papers a few years earlier and members of that family remembered the Wheeler wagon train as it traveled pas their home to Birch Lake early in the summer of 1924. Over the next 24 years the two families became very close, sealing friendships that would last a lifetime. Members of the McNeill family included: James Wallace (1866) and Martha Ellen McNeill (Church – 1874) and eleven children: Claude (1894), Clifford (1896), Ruby (1898), Irene (1901), Hazel (1902), Elizabeth (1905), David (1908), twins, Armina and Almira (1910), Floyd (1914) and Patricia (1916). It was, of course, the sixth born, David Benjamin who would play an important role in Laura’s young life. Family Photo: Rudy and Evelyn Roske (Laura’s sister and her husband, Lilly and Willam (her mom and dad), Howard and Myrtel Wheeler (her dad’s brother and his wife), Grandparents, Les and Tabatha. c1920 Sibbald-Alsask area threshing crew. Laura’s dad is standing on the threshing machine. Her Mother is standing beside Evelyn. c1920s Laura and her extended family. Names to be added. c1920s This photo, posted on FB by Laurie Dmytryshyn (Pylypow), is one of the few pictures of Grandma Martha Ellen McNeill (Church) (standing centre) surrounded by her young children. Kneeling, back row left is Hazel Dewan (McNeill)(this is Helen Pylypow’s (Dewan) mother), standing, far left, is Elizabeth Dewan (Harwood) (her daughter is Betty Monroe(Curtis)(Dewan). 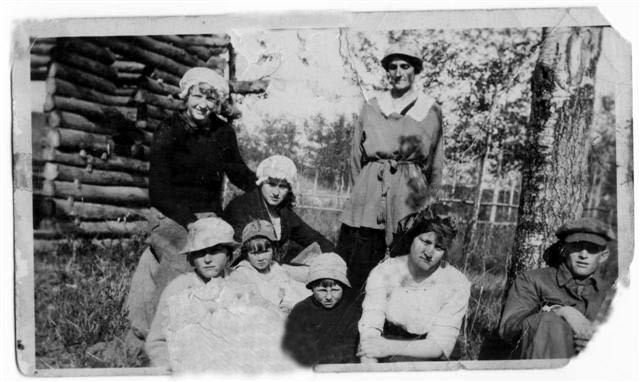 Front row, from left, Mina Crocker (McNeill) and Lolla David (McNeill), Floyd McNeill, Irene Ulna Johnson (McNeill) (Joyce Hayden’s mother), and seated by tree is Stanley Johnson (Irene’s first husband). 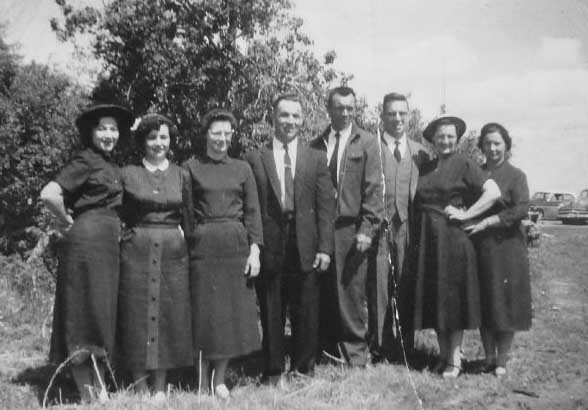 The other five children of Grandma McNeill are not in the photo (Claude, Clifford, David (Harold McNeill’s dad), Ruby and Patricia Humphries (Schirrmacher)(McNeill)(Gary Schirrmacher’s mother). While looking for my long lost family I have come across your site and see that my uncle Floyd is in one of the pictures, he was married to Alice Roske sister to Joe Roske my mother Evelyn Armstrong (Roske) father. You may remember my father Walter Armstrong he was killed at 28 (October 1960)not too far from Southy hauling a load of manure back to Regina. I spent many very happy summers with my Aunt Alice and Uncle Floyd on the farm and when they moved to Canmore I lived with them and Sue while working in Banff. My cousin Sue Foubert (McNeill)and I live close by and do visit when we can.